By the time he was 12, Donovan Welbaum was well on his way to becoming a dope-dealing, skinhead dropout. At age 13, he was shoplifting, snorting crushed pills and smoking two packs of cigarettes a day. 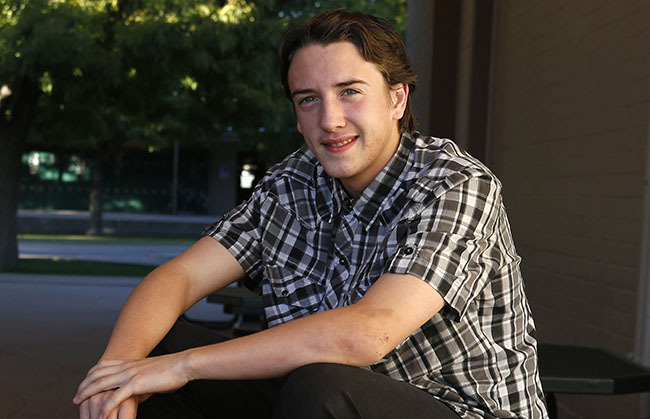 Donovan Welbaum, 15, said a scholarship to Phoenix Christian Preparatory School through GCU’s Donate to Elevate program saved his life. Today, the 15-year-old is leading a completely different life. He’s a sophomore at the Phoenix Christian Preparatory School. He gets good grades, plays the drums for his school’s worship team, has a perfect attendance record and conducts tours as a school ambassador. It was through this passion that Welbaum met up with Skate Park Outreach, a street ministry of the nonprofit Phoenix Dream Center, which serves low-income, homeless and struggling people. The Dream Center is an organization GCU supports and will honor during the Lopes men’s basketball game that is scheduled to tip-off at 7 p.m. Monday. “I was like, ‘Dude – they have hot dogs, and food, and bagels, and donuts,’ ’’ Welbaum said about Skate Park Outreach. But it was more than backpacks and snacks. The ministry, he said, was the hand of God reaching down and touching him and offering him a second chance. The Dream Center’s former youth director, Michael Carroll, who is enrolled at GCU as a Christian Studies major, selected Welbaum to apply for scholarships to Phoenix Christian, the teen said. Attending a private school with a steep tuition had never been an option for Welbaum, who has five half-brothers and half-sisters. He’d previously been enrolled in a number of public schools and had spent many of his younger years moving around the Valley and living with different relatives. Welbaum, 15, plans to keep his grades up and apply for a scholarship to GCU, where he would like to study engineering and counseling. Welbaum was 12 when arguments escalated between his mother, with whom he was living at the time, and her methamphetamine-addicted boyfriend. He turned to smoking pot to escape and was soon dealing Adderall, a stimulant typically prescribed for attention deficit hyperactivity disorder, and experimenting with hard drugs. In eighth grade, Welbaum received a scholarship, which was funded by Donate to Elevate, a program in which GCU employees may dedicate their state taxes to three different areas. Taxes may be directed to private schools, to public schools for continuing extracurricular activities or to Habitat for Humanity projects in GCU’s Canyon Corridor. Phoenix Christian’s choir is scheduled to sing the national anthem at the GCU men’s basketball game at 7 p.m. today and more than 140 students and staff have been invited to the game. Welbaum is grateful that God gave him a new fork in the road, and to stay on it, he undergoes voluntary drug testing weekly. He plans to keep his grades up so he can apply for a scholarship at GCU, where he wants to study engineering and counseling.